How Does a Heated Jacket Work? The winter is around the corner and I am sure that you might already feel some cool breezes. It is now the time to start preparing yourself as well as your clothing wardrobe for the upcoming winter. It is crucial that you have some useful clothing items to keep yourself warm, especially when you have to go out. Thanks to the development of technologies, we now have access to clothes which are super warm and also capable of retaining heat without adding extra weight and bulk. One of these helpful clothing items that I want to mention here is the heated jacket. The best heated jacket will help you to stay warm and flexible. You can enjoy wearing it when you have to take part in a lot of outdoor activities as well. There are quite a few models of heated jackets on the market with different prices, features, and qualities. It would take quite a lot of time to find the one that meets your unique and personal tastes. Take a look at the article below for the ultimate guide to choosing the best heated jacket for you. A heated jacket has the main purpose of providing heat to keep your body warm, especially when you have to go out on the cold winter days. In general, it can heat up thanks to the heating system, whether it is the wire or the panel system. These types of heating system use ion battery which can be recharged. When you turn on the heated jacket, the energy will start flowing throughout the wire or the panel system and give off heat. Depending on the heat capability and setting, the heat will warm up the jacket as well as our body. People who don’t want to wear a lot of clothes to keep themselves warm. They prefer little clothing so that they can be flexible and easy to move around as much as possible. If you often go outside, especially when you have to go somewhere on a motorbike, a heated jacket would surely be beneficial for you. It is quite easy to know about the benefits that a heated jacket can bring to you. As you can get from the name of the product, a heated jacket would be able to keep your body warm on cold days, especially when you have to go out. In addition, it is as warm as tons of other clothes. Hence, you don’t have to wear a lot of jackets to keep you warm. Instead, you now have a lightweight and non-bulky item with the same effectiveness. And I can’t stress enough the importance of keeping yourself warm on cold winter days. When you are warm, blood can flow at the normal rate, supporting your performance with your daily activities. Another worthy benefit of a heated jacket is that it is battery operated so you don’t have to charge it to make sure it works. Moreover, you can use the heated jacket that you are wearing to charge your electronic devices. With a heated jacket, of course, the first thing that you need to consider before you buy one is the heating ability. Different jackets of different qualities will deliver different degrees of temperature. It is also worth noting that different types of people will feel the same amount of heat in different ways. With a certain level of temperature, one person might think it is warm enough while some still think it is cold. The best way to determine whether a heated jacket is warm enough for you is to wear it before buying. There are several choices of styles for you to consider as well. The decision of which style of heated jacket you should buy is based on your personal preference. Some manufacturers such as Bosch only produce heated jackets in a single unique design. In case you are looking for other unique and different styles, you might as well look at some brands such as Milwaukee or Dewalt. 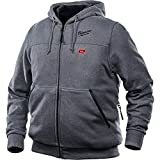 These companies offer you many styles such as zippered hoodies. You should consider your current styles and the existing pieces of clothing that you have in your wardrobe. This will help you to be able to pick the perfect style for you. Make sure that the heated jacket that you are going to purchase has soft and smooth inner lining. This will ensure you to be flexible. Especially the case when you wear something such as a sweatshirt or any form of garment underneath the heated jacket. In addition, the high-quality lining will help to add extra insulation, definitely a thing you need in the winter. Having pockets on the heated jacket will help you to store your personal belongings in your pocket. It’s useful especially when you take part in outdoor activities and don’t want to carry a lot of stuff. Think about how many items you want to bring with you. There are two options for internal and external pockets. The external pockets are more convenient and easy to access. Make sure they come with flaps to protect your personal items from the harsh weather. Different brands of heated jackets have different sizing charts. Therefore, you need to look at the specific sizing table of each different manufacturer. This will ensure you can find the best size for you. If you can, it is ideal if you can go shopping and try each heated jacket on to check whether it is a good fit. Remember to make some allowances for extra layers that you are going to put on underneath the heated jacket. In addition, you should look for a heated jacket with an ability to change to different levels of heat. You would be able to adjust the heat to the level that you feel most comfortable with. Moreover, in case you go to different areas and intend to wear it a lot of time, go for a heated jacket with the ability to change heat. When the jacket can change according to the conditions of the weather, it would be a very convenient option for the heated jacket to wear. As I mention above, there are a lot of different models of heated jackets that you can find on the market. I decided to try 5 of the most popular heated jackets and provide you with reviews of them in the section below. Keep in mind that all of them have their own pros and cons. You should think about your specific needs as well as the strengths and weaknesses of these products before making your final purchase. 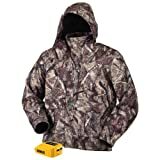 Its Main Features: The material of this heated jacket is polyester. It has the heat runtime of 6 hours. It is powered by the Bosch’s 12- volt max power tool battery system. There are 5 pockets for you to store your cell phone, document as well as battery holder at the side rear pocket. A package comes with the heated jacket, battery controller, battery, and charger. The material of this heated jacket is polyester, which is highly resistant to harmful elements of the weather including the rain and wind. This heated jacket is warm and cozy for a casual look. Unlike other heated jackets, this one comes with an extra layer of insulation for extra warmth on cold days. There are pockets behind the weather shielding flaps which are zippered with a high level of protection for you to store some of your personal belongings such as keys. It comes with 3 settings of heat levels including low, medium and high which can be easily adjusted with the push button settings. In addition, these heat settings are color code with an indicator to help you control your heated jacket better. There are 2 ways for you to keep your battery powdered adapted including putting into the rear pocket and clipping it on the belt. The pockets of this heated jacket are relatively small. Its Main Features: This heated jacket is made of polyester. It has the heat runtime of 7.5 hours. It is powered by the Dewalt’s 12- volt max power tool battery system. There are 7 pockets for you to store your cell phone, document as well as battery holder at the side rear pocket or left and right inner chest pockets. The design of this DEWALT heated jacket comes with larger space in the upper arms. It also provides the torso for you to wear extra pieces of layers underneath without feeling uncomfortable. It only takes around 30 minutes for you to recharge the battery. In addition, this heated jacket can heat up in a short amount of time. With the pre-heat function, you can enjoy wearing the jacket when it already comes to a comfortable temperature. There are different colors for different settings, making it easier for you to control. You can also check the battery usage and know when you have to recharge the heated jacket. It is super lightweight and slim fit, making it a great choice for you to have a lot of flexibilities during your activities. 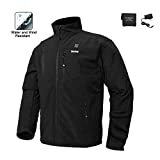 This heated jacket is not suitable for a job or any activity which is related to water and it is not waterproof and you can get injured once the water gets into the wire. Its Main Features: This heated jacket is made of polyester. It has the heat runtime of 8 hours. This heated jacket features the hoodies style with 4 heating zones including the left and right chest, the neck and the back. There are 3 heat settings for you to choose from including low, medium, and high which you can change by pushing a button. The packing list includes a heated jacket, battery, and charger. Like other high quality heated jackets that you can find on the market, this heated jacket is water resistant as well as wind resistant. There is an extra hood that comes along to add extra protection for your head in the severe weather conditions. This hood is removable so that you can easily choose whether to wear this hood or not. The carbon heating elements are one of the most effective heating system, which helps to heat up the heated jacket in a short amount of time. Finally, this heated jacket is made with a multi-step safety system to prevent accidents from happening in case of short circuit. Your safety is put into the maximum consideration. 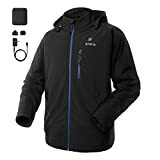 The zipper of this heated jacket is placed on the left side while most of the zippered clothing items that you can find on the market have a zipper on the right side. Its Main Features: This heated jacket is made of polyester. It has the heat runtime of 6 hours. This heated jacket features the hoodies style with 3 heating zones including the front left and right chest and the back. There are 3 heat settings for you to choose from including low, medium, and high which you can change by pushing a button. Inside the package, you have a heated jacket, battery, and charger. The temperature settings are color coded so that you can easily control the heated jacket to the warmth that you like. It is wind and water resistant to keep you dry and comfortable. Moreover, with the innovative technology, this heated jacket can be heated up in a short amount of time. There are a lot of pockets for you to store all of your belongings. There is a special pocket on the backside for you to store the battery. The sleeves, as well as the waistline of this jacket, can be adjusted to make sure you feel the snug fit as well as the most comfort when you wear this jacket for a long time. The construction of this heated jacket is very sturdy and solid thanks to the finely stitched line and soft lining. The size of this heated jacket runs a little bit smaller in comparison with other heated jackets of the same size. Its Main Features: This heated jacket is made of Ripstop polyester. It has the heat runtime of 8 hours. This heated jacket features the hoodies style with 2 heating zones including the front and the back. There are 3 heat settings for you to choose from including low, medium and high. All of the pockets on this heated jacket are lined with fleece to make sure you feel comfortable. It is also easy for you to wear large sweaters underneath. This heated jacket is capable of delivering heat to the pocket to keep them warm. As a result, you can put your hands inside these pockets and enjoy the heat from this heated jacket. The material of this heated jacket is of high quality, which is super sturdy and durable. It is super resistant to abrasion and less prone to tear. It also makes the heated jacket become lightweight and slim fit without sacrificing the heating ability. When you remove the battery and battery charger, you can wash this heated jacket with the washing machine and dry it in the tumbler. Last but not least, all of the lines are finely stitched to make sure this heated jacket has a heavy-duty construction. The battery and charger aren’t included in the packet. It takes longer time for this heated jacket to be warmed up in comparison with other types of heated jackets that you can find on the market. In case you are looking for a lightweight and slim piece of clothing which is also warm enough for you in the winter, you might find a heated jacket as a valuable purchase. There are a lot of things that you need to consider when choosing a heated jacket such as the storage options, style, designs, and heating abilities. You need to go through all of the most important features and consider among different models carefully. Only when you put in some energy and time searching that you would be able to find the best heated jacket, which meets all of your needs and requirements. I hope that with the guide above and our top picks for the best models, you would be able to make the most informed decision in a short amount of time.